Since 2010, World of Warcraft players have been creating hordes of pink-haired level one gnomes and running them across Azeroth to support the fight against breast cancer. This year Blizzard is giving the event a boost with special decorations, a cheering crowd and its own special quest. The tradition of running low-level gnomes across a danger-filled continent dates back to EverQuest in the early 2000s, back before World of Warcraft came along and took over the MMO-space. It’s a high danger, low stakes sort of thrill that helps pass the time between camping for things or waiting for raid timers to reset. 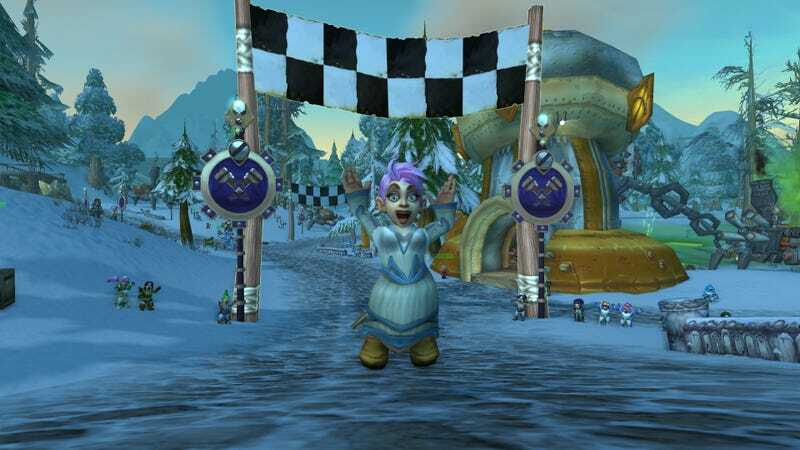 Using the “Running of the Gnomes” as a means to raise money for and awareness of breast cancer in World of Warcraft started back in 2009, when members of the Scarlet Crusade server Alliance guild SeeD decided to change their tabards to pink during October, aka breast cancer awareness month. In 2010 they started the first official “Running of the Gnomes” charity event, choosing WoW’s most diminutive race mainly because one of the starting hair color options is a lovely shade of pink. Nearly 150 players showed up for the run and after-party. In 2013 they had about a thousand, raising $1,305 for the Cleveland Clinic’s Tuohy breast cancer vaccine research and testing. Here’s a video of last year’s event, courtesy of YouTuber MultiSnapShot. Nearly 3,000 players participated, raising more than $5,000 for the charity. And here’s WowHead’s video (via PVPLive) detailing how official Blizzard support is changing the way naked gnomes run across Azeroth. Blizzard’s set up an official starting line for the event in New Tinkertown up North, with a quest that will guide players through some 40 gates along the route, finishing in Booty Bay on the southern tip of the Eastern Kingdoms. Cheering NPCs are scattered along the event path, giving the tiny pink-haired runners the extra motivation they need to get eaten by tigers in Stranglethorn. The new additions, currently on the Public Test Realm, should be ready in the core game in time for this October’s event.